[GEOTRACES] Imminent release of the new GEOTRACES Intermediate Data Product! Please broadcast this announcement as largely as possible.
. Why a new GEOTRACES Intermediate Data Product? 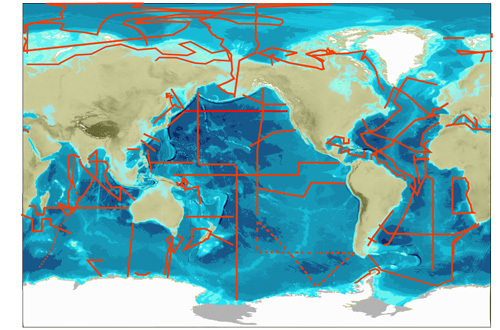 GEOTRACES is an international programme which aims to understand biogeochemical cycles and large-scale distributions of trace elements and their isotopes (TEIs) in all major ocean basins. This 3-dimensional scene shows the distribution of dissolved iron (Fe) in the Atlantic Ocean (warm colours indicate high concentrations). Iron is a nutrient essential for biological production. 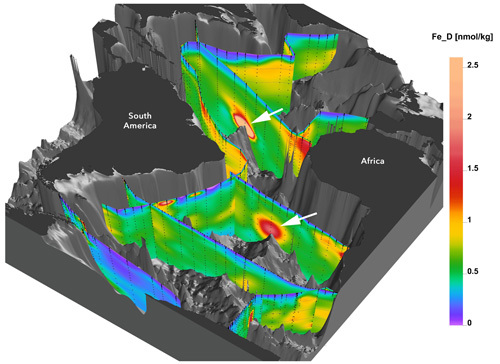 Thanks to GEOTRACES, strong hydrothermal iron sources were revealed in many locations along the Mid-Atlantic-Ridge (indicated by white arrows) challenging the long-standing view which considered these sources to be negligible. Improving our understanding of the oceanic iron cycle and its sensitivity to changing environmental conditions will improve projections of ocean's response to climate change.
. What will the new Intermediate Data Product bring? More GEOTRACES data = New exciting findings! It is recognised that low oxygen environments are favourable to the occurrence of soluble dissolved Fe. However, the above figures show that while dissolved Co maxima (indicated in warm colours: red, orange, etc.) strictly follow the layers corresponding to the lowest oxygen concentrations, dissolved Fe maxima are surprisingly occurring below these layers. Hydrothermal dissolved Fe input is significant, while nul for dissolved Co. Depicting these differences of behaviours among essential nutrient elements and others will result in even more exciting discoveries! Use the GEOTRACES IDP2017 and discover them!
. Where can I find the GEOTRACES IDP2017? (2) an on-line eGEOTRACES Electronic Atlas (eGEOTRACES.org) showing the distribution of these data such as the figures above. Note: The above hyperlinks are currently pointing to the IDP2014. These sites will be updated to include the IDP2017 data after the release of it. In addition to the anticipated usage for marine research, eGEOTRACES and the contained visual material can help in teaching and outreach activities and can also facilitate conveying societally relevant scientific results to interested laymen or decision makers.
. When will the GEOTRACES IDP2017 be released? Room: 252A/B (Palais des Congrés de Paris) - Room has changed!